Hi everyone. Hoping this is the correct area to post this. Please move if it's not. I am new at this and have been reading the threads here for awhile now. The information here is overwhelming but VERY useful! You guys (and gals) are loaded with experience and I am grateful to be able to read your experiences. I am a building contractor by trade but have some minor experience from what I've learned of my auto projects in the past. As I'm getting older (wiser maybe?) I am trying to be a little more safety conscious. My question would be about shop air filtration. I also do some wood working in my shop and am trying to decide between dust collectors and air filtration systems. Dust accumulation is always a killer whether you are spraying paint or breathing. Because I use my shop for everything, I am trying to find an air collection/filtration system that does all. I'm not sure if that's possible. Is body filler collection not as crucial as wood dust? I'm understanding the controls of anything sprayed is very important. Lots of good topics on spray booth set ups. The body shop dust control, and I'm focusing more on sanding body filler and paint, old and new. I can't seem to find any threads on this. I do try and wear a face mask over a dust mask when I feel it is necessary, but the shop air has always something floating in it while working. What are your opinions and experiences with this. Thanks for listening - Jim. 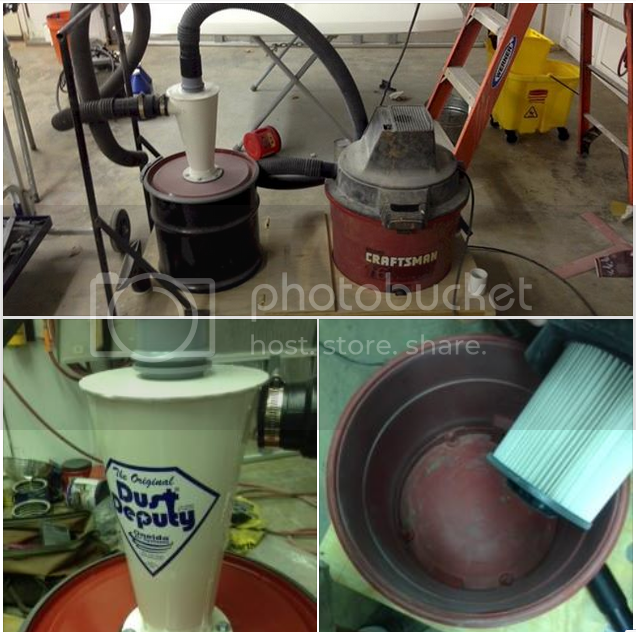 One of the best systems I've seen for dust collection was shown to me by one of my customers. He uses the Dust Deputy and raves about how well it works. You can see details linked to the top picture. The picture below is the system my customer built. Thanks for this Len I have heard about this system. Seems to be a superior to others? I'm still comparing.